Nail product manufacturers spend a great deal of time in research, development and testing prior to releasing a product. The type and combination of chemicals in any given nail product line are designed to work together as a complete unit in order to achieve the best possible results. Every manufacturers line of products have their own nuances and because of this, mixing products from different lines may result in various forms of service breakdown. For long-term wearability, always use complete systems when applying artificial nail enhancements. Always follow the manufacturers instructions and read and understand the warning labels on all your products. 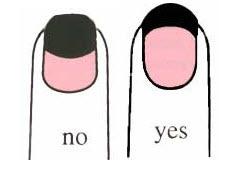 My first recommendation is to follow all the steps of preparation as outlined on the Nail Preparation page. Proper preparation prevents problems and is vital for achieving optimum results and preventing service breakdown. It is one of the pre-enhancement services that allowed me to charge $80.00 for a full set and $45.00 for 2-week maintenance. Pour a small amount of monomer into a dappen dish — use only what you will need for the particular service you are performing. Totally immerse and ‘swish’ your brush in the monomer to thoroughly wet the hairs and to remove any trapped air that may result in bubbles in the finished product. Air bubbles compromise the strength of the product and can lead to service breakdown. As you remove the brush from the dish, flatten hairs on both sides to shape the brush for sculpting and to drain excess liquid from the brush. Now you are ready for sculpting. More monomer = a larger bead, less monomer = a smaller bead. Dip the brush into the monomer according to the desired bead size. For a small bead, slide the flattened brush down the side of the dish and submerge only the tips of the flags (the darkest hairs) into the monomer. For a larger bead, moisten the entire flag area of the brush. Draw a line in the powder to the depth of the liquid line on your brush. The longer the line, the bigger the bead. Allow the monomer to surround the polymer particles. The bead should be medium in size and a medium-wet consistency. A medium-wet mix ratio will not immediately ‘melt’ down, it will have a slight ‘textured glass’ appearance, and maintain its shape when placed on the nail, tip or form. Place the bead at the smile line and in the center of the natural nail. Press the bead with the flags of the brush to flatten and separate the bead, then stroke to the extension edge. Press either side of center to flatten the bead and stroke to the extension edge, being sure that the level of product is evenly distributed. This section will be higher at the smile line (upper arch) and tapered to all edges. As you smooth with the brush from smile to extension edge, it is important to ‘follow-through- with the stroke in a downward motion. 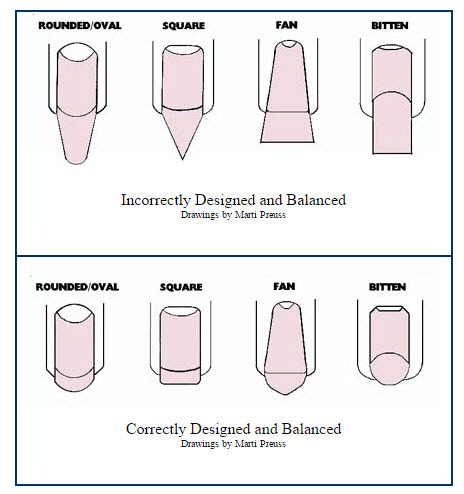 With the entire section 1 covered from side to side with product, the remaining 2-2 1/2 minutes of working time can be spent on perfecting the smile line for symmetry. Perfect the line when the product is very wet. Use a fluid motion to actually draw in the smile. Use baby presses to perfect the line and to ease the product further into the corners of the smile. Use ‘prep’ on a dedicated prep brush to clean up the smile line on the nail plate if needed. Pick up a medium size, medium-wet consistency bead (pink, clear or natural) and place on the nail surface just behind but still touching your previous section. Press the bead to flatten and stroke to smooth and blend with section 1. Continue in this manner until the entire section is blended and smooth. Pick up a small, medium-wet consistency bead and apply to section 3 in the same manner. Be sure this section tapers into the nail plate to avoid a ridge of product at the cuticle line. Leave a tiny margin all around the cuticle and sidewall line free of product. This will allow the product to properly shrink when cured (polymerized) and create an air-tight seal to the nail plate. Pressing and smoothing will assure total product control, eliminate bubbles in the product, allow for complete contact of the product to the natural nail plate, and eliminate excessive filing. Work with the brush flat, and keep the flattened surface parallel to the section you are working on. This means that the angle of the brush will change with each section. Using a 180 or 240-grit soft file, shape the free edge and sidewalls to the desired form. Smooth the surface of section 1, perfect the ‘C’ curve and taper to a thin edge. Perfect the upper arch of section 2 and blend smoothly with section 1. Blend cuticle area flush to the natural nail, but do not over-file the natural nail. Perfect sidewalls to a thin edge and blend with section 2. Apply a small amount of cuticle oil to all 10 nails. Massage into the cuticles and the overlay. With a 360-grit padded buffer, buff the oil into the surface of the overlay to remove scratches and plasticize the surface. Buff to a high gloss shine with a 3-way buffer: black side, white side, then the gray side. Ask the client to wash her hands to remove all traces of oil and buffing dusts. You may skip step 8 if you prefer to use an acrylic sealer rather than buffing to a shine. If the client has requested enamel, proceed to perform The Perfect Polish. Always book a 2-week maintenance appointment prior to the client leaving. Regularly scheduled maintenance appointments prevent service breakdown and needless or costly repairs. Discard or sanitize files, dry and store them in a sealed container with the clients name, address, phone number, profile card and any other special instructions for their next visit. Never touch your brush to the clients prepared nail plate or to the skin. Doing so may result in overexposure and allergic reaction from repeated and prolonged contact to the chemicals. Never apply product that is too wet. Too wet a mixture will not properly polymerize and the excess monomer will be absorbed into the nail plate which may cause an allergic reaction that could result in nail plate separation. Never over-file the natural nail plate as this practice will remove too many vital nail plate layers. Heavy grit files, heavy-handed filing or high-speed drills can heat the nail bed in excess of 150° F, resulting in a burn to the nail bed. Never smoke, eat or drink at the nail table to prevent cross-contamination between your food and the products. Smoke will deposit a layer of nicotine (oil) on the nail plate which may cause lifting. Your products are flammable, so keep them away from heat sources and sparks or flame. Proper preparation and application will prevent service breakdown problems. Work in a well ventilated area. Proper ventilation will remove airborne dusts and vapors from the building. Air conditioning only circulates the existing air in a room or space. Wear protective clothing to prevent dusts from settling on your skin. Wear a protective mask when filing to prevent inhalation of acrylic dust filings, and change it often. Take frequent breaks during the day to prevent the possibility of repetitive stress injuries. The application instructions are the same for a natural nail overlay and for an overlay on an already applied and prepared tip. Sculpting on a form requires a different technique in Section 1. When working on a form, Section 1 is sculpted on a slick ‘cool’ surface. Since there is no body heat coming through the form, it will slow down evaporation and set time. The product will seem wetter and take more time to get to a gel-like consistency where it can be pressed and smoothed with confidence. You must use delicate pressure when working with the product in this initial stage. Place a medium size medium-wet bead onto the form just in front of the natural free edge. Press the center of the bead to flatten and spread. Press the bead to the right sidewall. Press the bead to the left sidewall. Use the side of your brush to perfect the sideline and to create the lower arch. Perform this same procedure on the other side. Push the corners in at an angle to narrow the extension edge and/or to create an oval or almond shape. Using the tip of the brush to clean up the extension outline to a crisp line. Follow the ‘3-step’ spread & smile technique to perfect section 1 dimensions and to ‘tuck’ the corners to create a deep smile. Complete the application in Sections 2 & 3 by following the procedures for these sections in the Overlay instructions at the top of this page. A special ‘Thanks’ to Creative Nail Design Systems for donating the graphics for this page. I remember when I began my career as a nail technician – it was during the middle 1970’s when artificial nail products were first introduced to the Beauty Industry. We had no education, no product chemistry education, no educators, and no proper procedures to help us. The product most of us learned with was MMA. What is MMA? The correct terminology is Methyl Methacrylate – MMA for short. MMA has been prohibited for use in the nail industry since the late 70’s. Why? The following excerpt from Doug Schoon will explain MMA and why it has been prohibited by the FDA and most State Cosmetology Commission boards. One of the most controversial topics in the professional beauty industry involves a monomer liquid called MMA or methyl methacrylate. Unfortunately, there are many myths and misunderstandings surrounding the use of this ingredient. Most nail technicians know they should not use products containing this ingredient, but they don’t know why! This lack of proper information opens the door for speculation and rumors. Generally, when you ask someone why MMA should not be used, they will immediately respond that MMA is toxic. Although it is true that you should not drink MMA liquid, the same holds true for salt water and rubbing alcohol. MMA is not a human cancer causing agent and it does not absorb through the nail plate to affect the health of clients or nail technicians. Nor is it dangerous to inhale in the salon environment. Scientific information collected about MMA shows that toxicity is NOT the reason MMA makes a poor nail enhancement ingredient. In fact, for many years MMA has been safely implanted in the body as a bone repair cement – so it is not a dangerous toxin, as many imagine. The FDA says don’t use it! This is clearly the most important reason. The FDA bases their prohibition on the large number of consumer complaints resulting from the use of MMA nail enhancements in the late 70’s and they continue to maintain this position today. So, what are we using to create artificial nail enhancements? EMA or Ethyl Methacrylate. What is the difference? The following is an explanation of the differences between MMA liquid and EMA liquid from Paul Bryson, Co-Director of Research & Development for OPI Products. Chemically speaking, sometimes a very small difference in a molecule’s structure can make a big difference in its effects. Ethyl methacrylate (EMA) has a slight, but significant, difference in molecular structure from MMA that makes EMA much safer to use. More specifically, EMA has a carbon atom and two extra hydrogen atoms compared to MMA. This may not seem like much, but the effects are large. An analogy is the difference between Methanol (wood alcohol) and Ethanol (beverage alcohol). As with MMA versus EMA, the difference between the two is just one carbon and a couple of hydrogen atoms; yet one is a deadly poison and the other is safe if used moderately. Experience has shown that MMA is strongly sensitizing and has a high potential to damage nails and surrounding tissue. Some people may use it and be OK, but that is just luck. Enough people were harmed by MMA, that is why the FDA prohibited the material from nail use 2 decades ago. EMA has a somewhat larger molecule, and is less able to penetrate body tissue. Many years of salon experience indicate that this material is safe for most people. Of course, just as with any food, drug or cosmetic, there are always going to be a FEW people allergic to it. And long-term overexposure to ANY acrylic – even odorless or gels – can cause sensitivity to gradually develop. In the early 1970s, FDA received a number of complaints of personal injury associated with the use of fingernail extenders containing methyl methacrylate monomer. Among these injuries were reports of fingernail damage and deformity, as well as contact dermatitis. On the basis of its investigations of the injuries and discussions with medical experts in the field of dermatology, FDA concluded that liquid methyl methacrylate was a poisonous and deleterious substance that should not be used in fingernail preparations. The agency chose to remove products containing 100 percent liquid methyl methacrylate monomer through court proceedings, which resulted in a preliminary injunction against one firm as well as several seizure actions and voluntary recalls. Although there is no specific regulation prohibiting the use of liquid methyl methacrylate monomer in cosmetic products, FDA continues to believe that this substance, when used in cosmetic fingernail preparations, is a poisonous and deleterious substance. MMA has an unusually strong or strange odor which doesn’t smell like other acrylic liquids. Odor is present during application and when filing cured product (for fill-ins or repairs). Cloudy or milky color when cured. Unlabeled containers – technician will not show or tell the client what brand of product is being used. For more information on MMA, please visit this site: http://www.beautytech.info This site has many articles relating to nails for the consumer, and is very informative. A day out getting your nails done can be so relaxing and a great way to pamper yourself. What isn’t relaxing is having one of the nails break the very next day. Acrylic nails can cost anywhere from $50 to several hundred dollars, depending on where you have them done. Obviously, you want your nails to last longer than a couple days. Thankfully, there are simple things you can do to extend the life of your acrylic nails. Acrylic nails are extremely fragile during the first 24 hours. The slightest tap against something hard may not break them immediately, but there may be small fractures that aren’t noticeable. These hairline fractures will eventually cause the nail to split. During the first 24 hours, you may want to avoid any activities that put strain on your nails, such as typing or doing work with your hands out in the cold, which could make the nails more brittle. Woman are used to using their nails as tools. You may use them to pry things open, scratch stickers off newly purchased items or to simply open a can of soda. Regardless of how you used your nails in the past, you should never use your acrylic nails to get a job done. The stress that these tasks can put on the nails will cause the nails to break. A nightly dab of lotion keeps the hands looking soft and supple. Unfortunately, lotions and hand creams can also cause your acrylic nails to come lose. When applying any type of lotion or cream, you want to make sure to avoid the cuticle area. Too much lotion is this area can cause the glue to weaken and the nails will become loose. Cuticle oil can do wonders for acrylic nails. It’s recommended that you use the oil as often as possible, but especially every night before bed. The oil can help prevent lifting, breaks and bubbles from appearing. Your new acrylic nails don’t have to look old and worn out the next day, or even next week. There are a number of easy tips you can use to keep them looking new for as long as possible. Just remember to avoid lotions and hand creams, but do use cuticle oil to prevent breaks and lifting. You should also be cautious with your nails during the first 24 hours and never use them as tools to get jobs done. While becoming a nail technician may seem like a quick way to get into the working world and make some cash, there are rules and regulations regarding the work nail technicians do. While the regulations vary from state to state, many states will require that anyone working with adhesives, acrylic, and other solutions be licensed or certified. Here are some things you’ll need to do in order to become a nail technician. The type of program you choose will vary depending upon whether you want to be a cosmetologist, working with makeup, hair, and maybe even skin care, or just a nail technician. While the regulations for getting one vary, all 50 states require you to have a license. Most nail technician programs are able to give you a license as soon as you complete your educational program. You’ll need to make sure the school you are considering is approved by your state to grant a license upon completion of course requirements and graduation. You’ve chosen a school with either a full-time or part-time program. Most full-time programs take approximately 3-6 months to complete while part-time programs can take quite a bit longer. Throughout your classes you will learn about the different types of procedures used to treat nails, including the application of different types of manicures and pedicures and the different types of artificial nails, including gel, acrylic, tips, and silk wrapped nails. While most states do not require you to obtain an apprenticeship, your school program may require you to participate in one before you can graduate. An apprenticeship is often completed in a licensed establishment and is designed to ensure you have working experience before you go out on your own to try and find work or start your own business. While you don’t have to take a separate exam to become licensed, you will be responsible for keeping your license up to date. The requirements for doing so will vary from state-to-state but generally require you to renew your license every year or two. You’ll need to check your state’s guidelines to determine if you will be required to take any sort of continuing education course. The choice to become a nail tech is one you’ll be proud of. You’ll have the opportunity to work with a wide variety of people while building a business you can sustain on your own. Take your time, do your best work, and build a strong client base. You’ll never regret the choice!